The book I have been writing for the past year and a half is finally done. 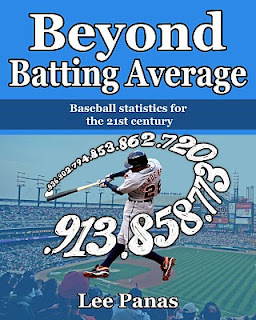 Titled Beyond Batting Average, this book is designed to help knowledgeable baseball fans gain a better understanding of the multitude of new statistics that have been introduced on the Internet and elsewhere in recent years. It puts everything in one place and ties all the metrics together into an organized 15 chapter story. This comprehensive sabermetrics primer will introduce fans to these new measures with easy to understand explanations and examples. It will also illustrate the evolution of baseball statistics from simple traditional measures to the more complex metrics used today. You will learn how all the statistics are connected to winning and losing games, how to interpret them and how to apply them to performance on the field. By the end of this book, you should be able to evaluate players and teams through statistics more thoroughly and accurately than you could before. As an added bonus, the book contains the never seen before artwork of Samara Pearlstein who writes Roar of the Tigers and Blue Cats and Red Sox. Included is the beautiful cover seen above, as well as several illustrations inside the book. I believe it is some of her finest work. The book can be purchased at Lulu.com. Congrats Lee; just placed an order and can't wait for it to ship. Ditto on the congratulations! Just placed an order. Getting Samara to contribute artwork was a brilliant idea too. Congratulations on the book! May it sell a million and one copies! Many congrats are in order. So happy for you! Thanks very much for the congratulations and purchases! Awesome, Lee. I'll be purchasing a copy sometime soon. I ordered and told 20 other people to do the same, Lee. Thanks for writing this book!